John Melcher (born September 6, 1924) is an American politician of the Democratic Party. 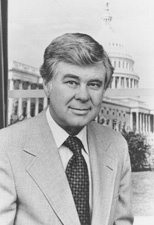 He represented Montana in the United States House of Representatives, and as a United States Senator from 1977 until 1989. Melcher was born in Sioux City, Iowa. He studied at University of Minnesota and at Iowa State University. John Melcher Facts for Kids. Kiddle Encyclopedia.